Accumulation of phlegm damp in the lung causing chronic bronchitis, emphysema and asthma. Accumulation of mucus and food matter in the stomach leading to nausea, vomiting, poor appetite, dizziness and vertigo. Helpful for morning sickness, acid regurgitation, heartburn and goiter are some of the imbalances satisfied clients have used this product for. 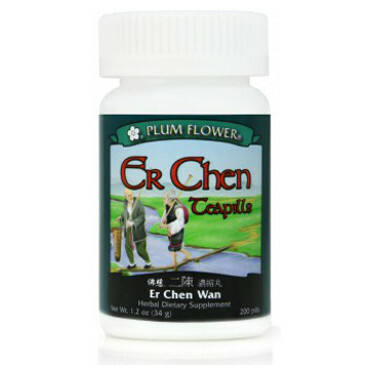 Dries Dampness, Transforms and Dispels Phlegm, Dries Dampness, Regulates Qi, Harmonizes Spleen and Stomach. Pinellia ternata rhizome, Citrus reticulata peel, Poria cocos fungus, Glycyrrhiza uralensis root, Zingiber officinale rhizome-fresh, Botanical wax, Talcum. - Ban xia, Chen pi, Fu ling, Gan cao, Sheng jiang, Botanical wax, Talcum. Contraindicated for cough due to dryness or Lung Yin deficiency. Excessive or improper use of this formula can lead to excessive thirst and a dry throat.